Born at Parry Sound, Ontario on 2 December 1895, son of Joseph Stevenson and Anne Laura Quinn, in the early 20th century he came with his family to Winnipeg, where he attended Kelvin High School and Wesley College. In 1916, he enlisted in the Canadian Expeditionary Force. An officer in the Royal Air Force, he won the Distinguished Flying Cross and the Croix de Guerre. During the Russian Civil War after the 1917 Revolution, he trained White Russian pilots in the Crimea to fight the Bolsheviks. 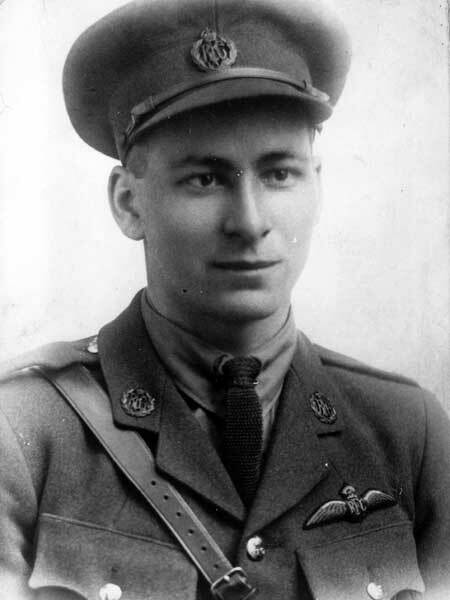 Returning home after the war, he became Canada’s leading commercial pilot. In 1927 he flew 30 tonnes of cargo from The Pas to Sherritt-Gordon Mines, proving that heavy and bulky material could be flown into remote areas. He was a charter member of the Gyro Club of Winnipeg. He died in a plane crash at The Pas on 5 January 1928 and was buried in Brookside Cemetery. Stevenson Field, later the Winnipeg International Airport, now the James Armstrong Richardson International Airport, was named after him. He is commemorated by Stevenson Road and Stevenson-Britannia School. Frederick Joseph Stevenson, Dictionary of Canadian Biography. “Capt. Stevenson of Airways dies as plane falls,” Winnipeg Tribune, 5 January 1928, page 1. “Airplane crash victim will be buried Monday,” Winnipeg Tribune, 7 January 1928, page 6. “Noted pilot buried in Brookside Cemetery,” Manitoba Free Press, 10 January 1928, page 18.